The Colonne du Guesclin marks the site where the Château de la Motte-Broons, where the castle of Bertrand du Guesclin once stood. You'll find it on the outskirts of the village of Broons. The original Motte-Bron Castle was a simple defense tower erected on a man-made mound. It commanded the river crossing and the marsh. Documents from 1109 refer to Pleardus, Lord of Bron and vassal of Olivier de Dinan. In 1251 Robert du Guesclin married Lord Bron's daughter. Their grandson, Bertrand du Guesclin inherited the castle and rebuilt it in 1355. The castle consisted of a central building flanked by four towers and protected by a moat and a drawbridge. Bertrand died in 1380 and his brother Olivier inherited Bron. However, the fortress' strategic location caused many conflicts. It therefore changed hands many times during the wars of succession to the Duchy of Brittany. The Duke of Brittany Charles de Montfort eventually seized it after a lengthy siege. The Duchesse Anne de Bretagne (1477-1514) married King Charles VIII of France in 1491. Widowed in 1498, she re-married Louis XII in 1499. Brittany was permanently attached to the kingdom of France in 1532. However, the Duke of Mercoeur, the then owner of Bron, took the head of the Breton rebellion when Henri IV became king in 1553. Indeed, Mercoeur wanted to restore the sovereignty of the duchy on the principle that his wife descended from the Duchess of Brittany Jeanne Penthièvre. However, Mercoeur surrendered to Henri IV in 1598. The king ordered the demolition of La Motte-Broons in order to avoid any further claim of independence. However, the castle was only pulled down in 1616 by order of his widow, Marie de Medici. However, the ruins remained in place until the 19th century and the villagers used them as stone quarry. 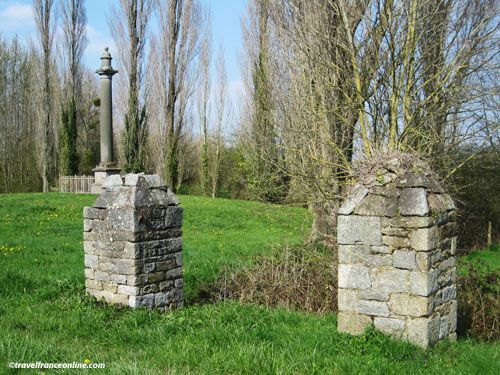 There is therefore nothing left of the Château de la Motte-Broons except two pillars that once framed its entrance gate! 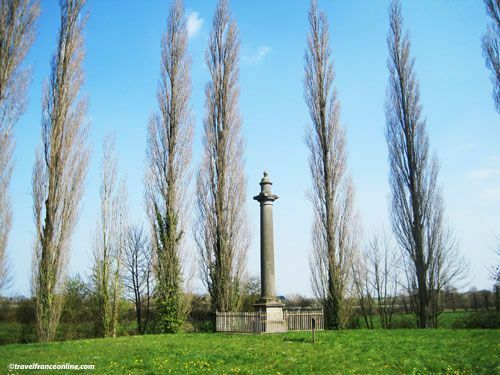 A 10m high granite column was erected in 1841 in order to commemorate the memory of Bertrand du Guesclin. The Colonne du Guesclin stands on the site of the fortress, at a place called Le Pont-du-Château. It seems that the Celtic tribes who settled in Brittany recognized the strategic situation of the spot. The name Bron is indeed from Celtic origin and meant hillock. It evolved, though, in a very unusual way. The second O and the S appeared only after the French Revolution. A circumflex accent was then added during the 19th century, but was replaced by a diaeresis in the early 20th century. Broons, Brôons and Bröons are therefore all correct. Did you know that du Guesclin duelled with Thomas Canterbury in Dinan in 1357?